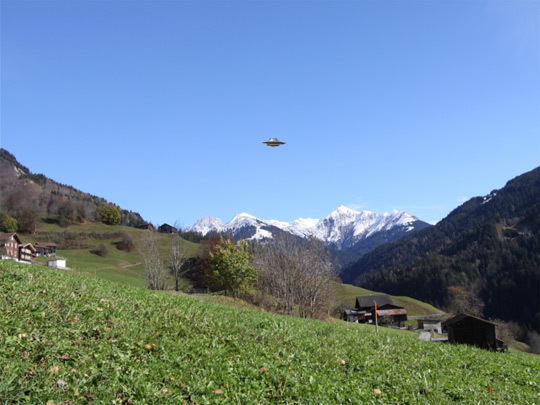 After examining all of the UFO photos taken by Billy Meier which are part of the Wendelle Stevens collection, it is the assessment of this author that some of them are 100% fabricated, and therefore must be deemed hoaxes. Of all the alleged UFO contact cases, one in particular stands out from all the rest. The case of Eduard “Billy” Meier has polarized Ufology for at least thirty-five years. Legions of so called “followers” support the case without question, while the scientific community in general believes the entire account to be an elaborate hoax. 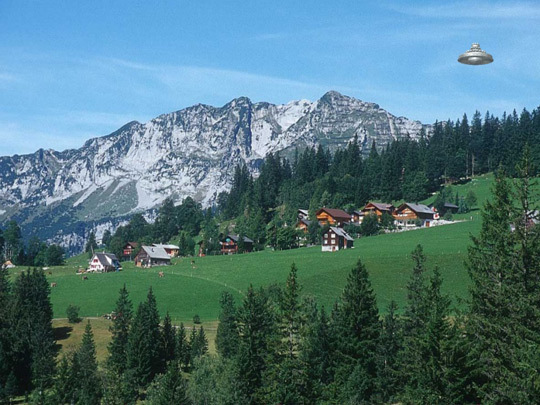 Starting on January 28, 1975 Billy Meier (resident of Schmidruti Switzerland) claims to have photographed authentic extraterrestrial spacecraft. He further claims that the occupants of these vehicles travelled to earth from the M45 star-cluster known as the Pleiades in the constellation Taurus. 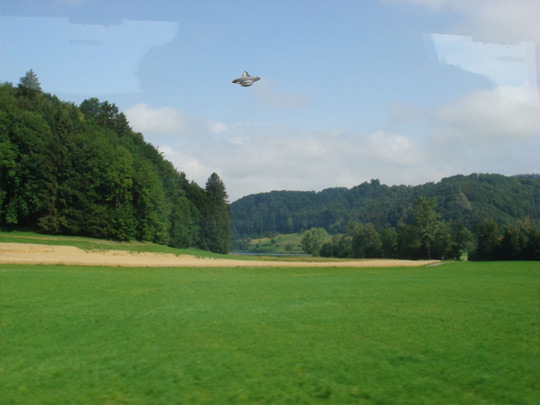 However, are the photos taken by Billy Meier authentic, and can they be duplicated using modern computer techniques? Furthermore, what specific points can be learned by comparing the Billy Meier photos against other purported UFO photos which are part of the vast collection compiled by the late Col. Wendelle Stevens? Multiple grouped UFO’s photographed in the same shot. 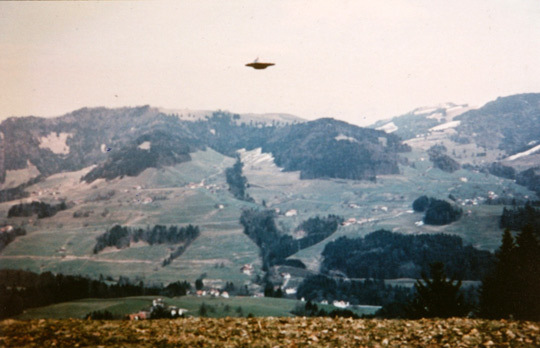 Photograph of Type II “Beamship” by Billy Meier March 18, 1975. The photo above fails the authenticity test on three accounts. The object is perfectly composed in the frame, and also appears to be perfectly focused. In addition, the UFO is positioned exactly about the 90 degree vertical axis without the slightest hint of a slant. 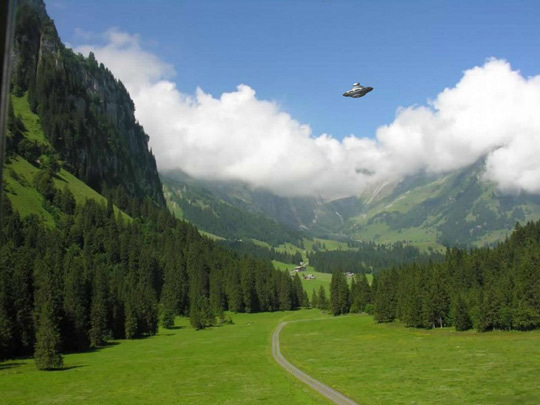 Per comments made by Billy Meier, the “Beamship” landed on the ground, and its occupant known as “Samjase” personally met with Meier multiple times. However photographs of this craft on the ground have never surfaced. Could this be due to the fact that the logistics of building a twenty-two foot diameter mock-up were too cost prohibitive? Computer forensic composite image by Michael Schratt. Photograph of Type IV Beamship by Billy Meier March 29, 1976. In the above photograph, the UFO is perfectly composed in the frame, and centered about the vertical axis. Note that the craft appears very large in this photo (evidence of the forced or false perspective technique in use). Note “eye-screw” used to suspend model. Additional shots of the Beamship show clear evidence of fakery. Note the use of an “eye-screw” which was clearly utilized to hang the model from a suspension rig. In the process of building UFO models used to hoax photos, ordinary household items such as cups, bowls and paper plates can eventually weigh up to one pound making a robust attachment point a necessity. Computer generated composite illustration of Type IV Beamship by Michael Schratt. 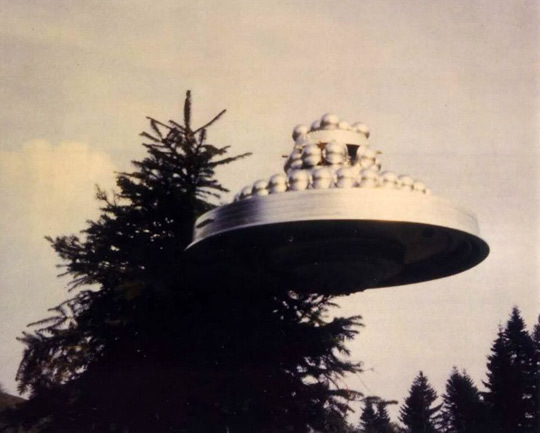 Photograph of “Wedding cake” UFO by Billy Meier April 3, 1981. Photo of Wedding cake UFO. The above two photos really are a laughable joke, and should never be considered authentic for multiple reasons. The craft is grossly out of proportion, and perfectly focused. Also note that it is perfectly oriented about the vertical axis. Note the close proximity of a tree in the background which may have been used to support the model. Looking closely at the image, it’s clear that ordinary materials were used to construct the craft. For the base, a standard plastic bin lid was used. For the “lower deck”, readily available plastic spheres were utilized. Ordinary brass shelf supports (see red ellipse) were used on the “mid deck” to give the craft a more “technical look”. Also note the gap between the spheres on the mid deck (shown by red arrow) indicating that there were spacing errors encountered during the assembly process. Also note in the above photo that you can’t actually see the craft sitting on the ground. Could this be because showing the entire bottom of the craft would give away its actual size? Computer generated forensic composite illustration by Michael Schratt. 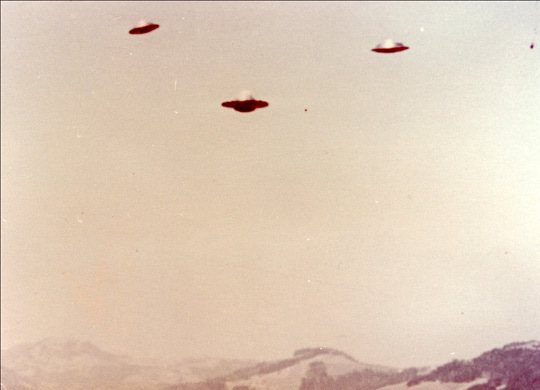 Photo of multiple Beamships taken by Billy Meier on March 8, 1976. Note in the above photo that there are three different shaped UFO’s in the same shot. This is an EXTREAMLY rare occurrence. 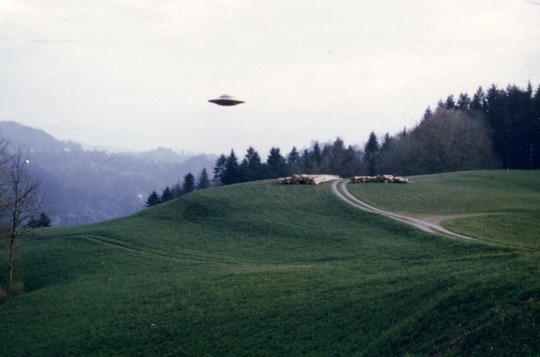 In fact, Billy Meier seems to be the only person alive on earth to have captured such an image. Note that two of the vehicles appear aligned about the vertical axis. Also note that the three craft are grouped together relatively closely. Might this be due to the fact showing one vehicle separated from the other two would bring it out of the field of view exposing multiple suspension rigs? Computer generated image of “Reconnaissance Ship” by Michael Schratt. 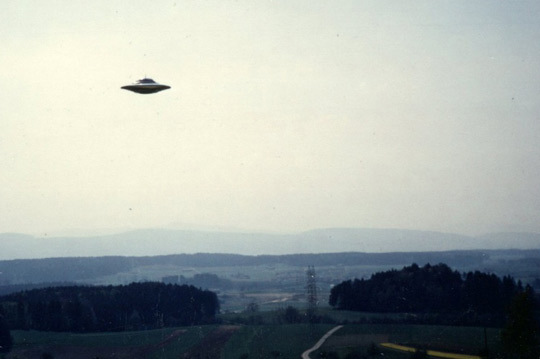 Photo of Beamship Type III taken by Billy Meier on March 8, 1976. 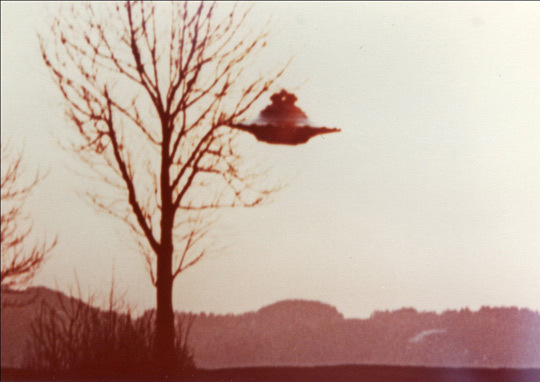 Note that the above photo was taken on March 8, 1976 which turns out to be the same date as Billy Meier’s multiple craft encounter (described above). This indicates that Meier had two separate encounters with different craft on the same day (highly unlikely). Also note that the craft is perfectly focused, and centered within the frame. The vehicle appears directly oriented about the vertical axis (exactly what would be expected due to the natural effect of gravity pulling on a suspension line). Note the relatively large size of the craft indicating additional use of the forced perspective technique. Computer generated illustration of Beamship Type III by Michael Schratt. Photo of Beamship Type I taken by Billy Meier on June 14, 1975. The above photo shows signs of the forced perspective technique in use. Additionally, the craft is perfectly in focus, and aligned about the vertical axis. Computer generated illustration of Beamship Type I by Michael Schratt. 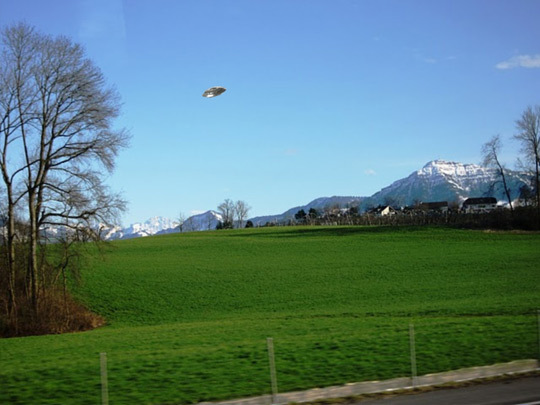 After examining all of the UFO photos taken by Billy Meier which are part of the Wendelle Stevens collection, it is the assessment of this author that some of them are 100% fabricated, and therefore must be deemed hoaxes. The fact that none of the craft photographed exhibit any type of field propulsion distortion adds to this conclusion. 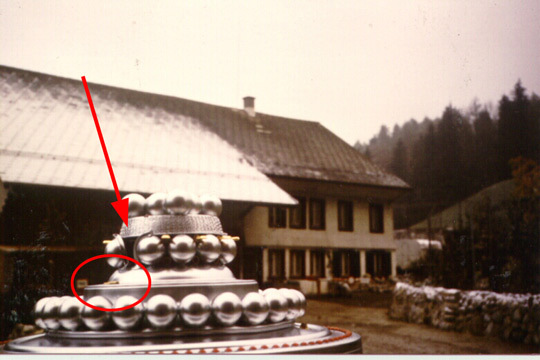 Keeping in mind the physical properties of scale, proportion, line-of-sight, field of view, and focus, it appears that some the purported Billy Meier photos appear to be small scale models (approximately 14” in diameter) which have been suspended in front of the camera. Later, additional photo trickery was applied to remove any evidence of strings or wires. If the alleged encounters with these UFO’s did actually take place, why is it then, that none of the residents of the homes in the immediate vicinity photographed them? So called “metal samples” recovered from the Beamships by Billy Meier were independently examined by the University of Arizona, and were determined to be ordinary Copper and Silver. 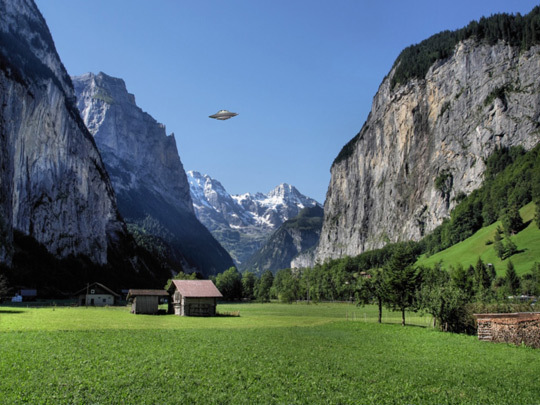 The case of Billy Meier should serve as a warning to Ufologists, and the general public as well to the dangers of “jumping on the UFO bandwagon” before a rigorous independent third party investigation is completed. Indeed the words of the late Carl Sagan apply: “extraordinary claims require extraordinary evidence”. Listen to the hosts of Open Minds Radio discuss Billy Meier here, and at this link you can hear Billy Meier’s official US representative, Michael Horn, explain why he thinks the case is legitimate (show airs 10/3/2011 at 7 pm pacific).